How does Chota Hazri’s “Play:” ability work? Do I have to lose 1 Æmber even if I cannot forge a key? Yes. You must resolve as much of the “Play:” effect as possible. If you have any Æmber, you lose 1. I have Hunting Witch in play (“Each time you play another creature, gain 1 Æmber.”) and 6 Æmber in my pool. 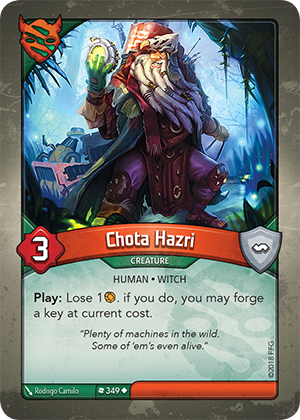 If I play Chota Hazri, can I forge a key? Yes. “Play:” abilities trigger only after a card enters play. When you play a creature (such as Chota Hazri) with Hunting Witch in play, you first gain 1 Æmber, bringing your Æmber total to 7. Then, Chota Hazri’s “Play:” ability triggers, causing you to lose 1 Æmber and allowing you to forge a key if the current cost is 6.